Following up on the discussions on these two previous blogposts, I've put my argument why Poincaré-invariant networks in Minkowski space cannot exist into writing, or rather drawing. The notes are on the arxiv today. The brief summary goes like this: We start in 1+1 dimensions. Suppose there is a Poincaré-invariant network in Minkowski space that is not locally infinitely dense, then its nodes must be locally finite and on the average be distributed in a Poincaré-invariant way. We take this distribution of points and divide it up into space-time tiles of equal volume. Due to homogeneity, each of these volumes must contain the same number of nodes on the average. Now we pick one tile (marked in grey). In that tile we pick one node and ask where one of its neighbors is. For the network to be Poincaré-invariant, the distribution of the links to the neighbor must be Lorentz-invariant around the position of the node we have picked. Thus the probability for the distribution of the neighboring node must be uniform on each hyberbola at equal proper distance from the node. 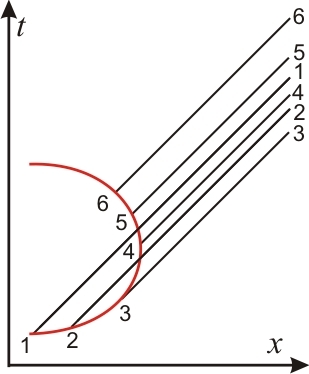 Since the hyperbolae are infinitely long, the neighbor is with probability one at infinite spatial distance and arbitrarily close to the lightcone. The same is the case for all neighbors. Since the same happens for each other node, and there are infinitely many nodes in the lightlike past and future of the center tile, there are infinitely many links passing through the center tile, and due to homogeneity also through every other tile. Consequently the resulting network is a) highly awkward and b) locally infinitely dense. This argument carries over to 3+1 dimensions, for details see paper. This implies there aren't any finite Poincaré-invariant triangulations, since their edges would have to form a network which we've just seen doesn't exist. What does this mean? It means that whenever you are working with an approach to quantum gravity based on space-time networks or triangulations, then you have to explain how you want to recover local Lorentz-invariance. Just saying "random distribution" doesn't make the problem go away. The universe isn't Poincaré-invariant, so introducing a preferred frame is not in and by itself unreasonable or unproblematic. The problem is to get rid of it on short distances, and to make sure it doesn't conflict with existing constraints on Lorentz-invariance violations. I want to thank all those who commented on my earlier blogposts which prompted me to write up my thoughts. This year, Einstein’s theory of General Relativity celebrates its 100th anniversary. 2015 is also the “Year of Light,” and fittingly so, because the first and most famous confirmation of General Relativity was the light deflection on the Sun. As light carries energy and is thus subject of gravitational attraction, a ray of light passing by a massive body should be slightly bent towards it. This is so both in Newton’s theory of gravity and in Einstein’s, but Einstein’s deflection is by a factor two larger than Newton’s. Because of this effect, the positions of stars seem to slightly shift as they stand close by the Sun, but the shift is absolutely tiny: The deflection of light from a star close to the rim of the Sun is just about a thousandth of the Sun's diameter, and the deflection drops rapidly the farther away the star’s position is from the rim. A century passed and physicists now had somewhat more confidence in their technology, but still they had to patiently wait for a total eclipse of the Sun during which they were hoping to observe the predicted deflection of light. In 1919 finally, British astronomer and relativity aficionado Arthur Stanley Eddington organized two expeditions to observe a solar eclipse with a zone of totality roughly along the equator. He himself travelled to Principe, an island in the Atlantic ocean, while a second team observed the event from Sobral in Brazil. The results of these observations were publicly announced November 1919 at a meeting in London that made Einstein a scientific star over night: The measured deflection of light did fit to the Einstein value, while it was much less compatible with the Newtonian bending. As history has it, Eddington’s original data actually wasn’t good enough to make that claim with certainty. His measurements had huge error bars due to bad weather and he also might have cherry-picked his data because he liked Einstein’s theory a little too much. Shame on him. Be that as it may, dozens of subsequent measurement proved his premature announcement correct. Einstein was right, Newton was wrong. By the 1990s, one didn’t have to wait for solar eclipses any more. Data from radio sources, such as distant pulsars, measured by very long baseline interferometry (VLBI) could now be analyzed for the effect of light deflection. In VLBI, one measures the time delay by which wavefronts from radio sources arrive at distant detectors that might be distributed all over the globe. The long baseline together with a very exact timing of the signal’s arrival allows one to then pinpoint very precisely where the object is located – or seems to be located. In 1991, Robertson, Carter & Dillinger confirmed to high accuracy the light deflection predicted by General Relativity by analyzing data from VLBI accumulated over 10 years. But crunching data is one thing, seeing it is another thing, and so I wanted to share with you today a plot I came across coincidentally, in a paper from February by two researchers located in Australia. 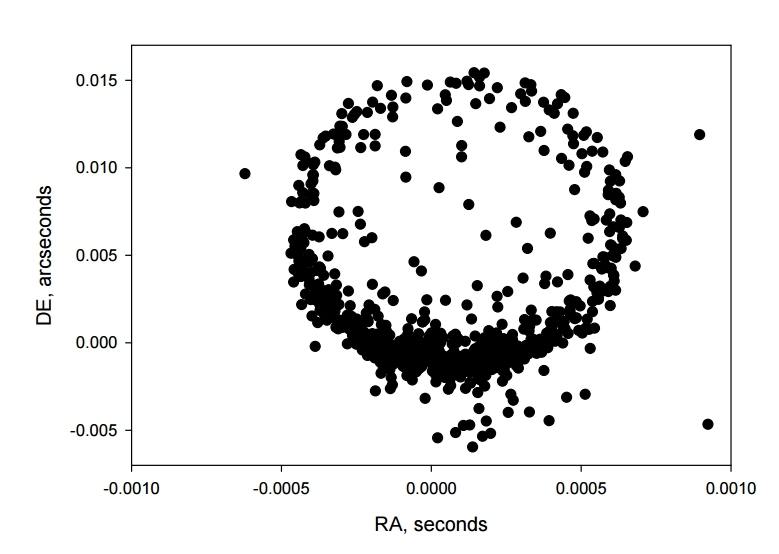 They have analyzed the VLBI data from some selected radio sources over a period of 10 years. In the image below, you can see how the apparent position of the blazar (1606+106) moves around over the course of the year. 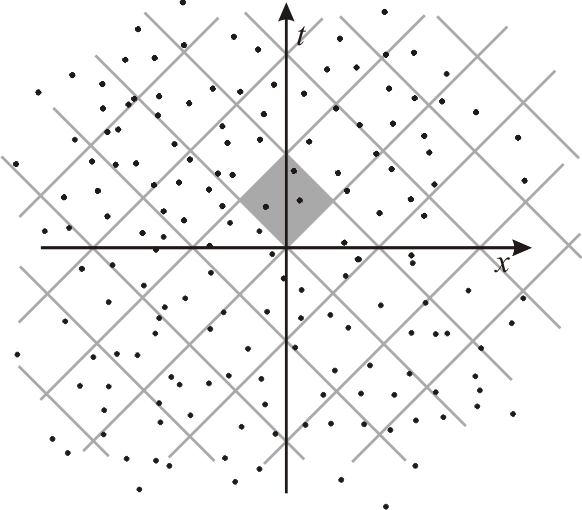 Each dot is one measurement point; the “real” position is in the middle of the circle that can be inferred at the point marked zero on the axes. How is that for an effect that was two centuries ago thought to be unobservable? The "publon" is "the elementary quantum of scientific research which justifies publication" and it's also a website that might be interesting for you if you're an active researcher. 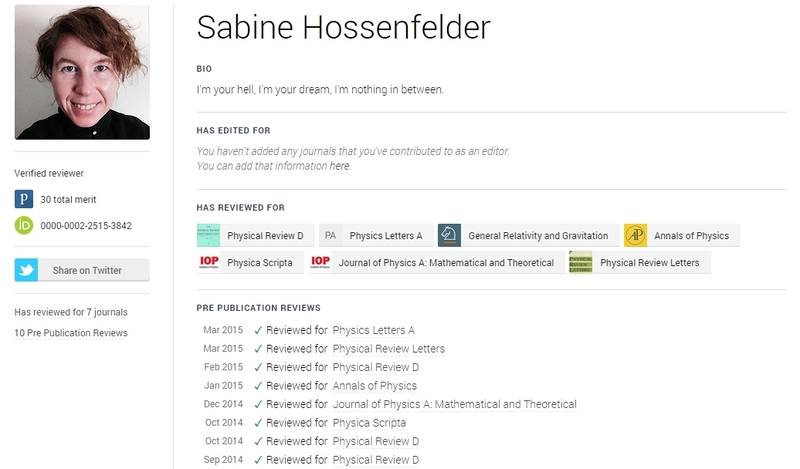 Publons helps you collect records of your peer review activities. On this website, you can set up an account and then add your reviews to your profile page. You can decide whether you want to actually add the text of your reviews, or not, and to which level you want your reviews to be public. By default, only the journal for which you reviewed and the month during which the review was completed will be shown. So you need not be paranoid that people will know all the expletives you typed in reply to that idiot last year! You don't even have to add the text of your review at all, you just have to provide a manuscript number. Your review activity is then checked against the records of the publisher, or so is my understanding. The folks behind the website almost all have a background in academia and probably know it's pointless trying to make money from researchers. One expects of course that at some point they will try to monetize their site, but at least so far I have received zero spam, upgrade offers, or the dreaded newsletters that nobody wants to read. In short, the site is doing exactly what it promises to do. I find the profile page really useful and will probably forward my other "Thank You" notes (to the extent that I can dig them up), and then put the link to that page in my CV and on my homepage. Photonic Booms: How images can move faster than light, and what they can tell us. If you sweep a laser pointer across the moon, will the spot move faster than the speed of light? Every physics major encounters this question at some point, and the answer is yes, it will. If you sweep the laser pointer it in an arc, the velocity of the spot increases with the distance to the surface you point at. On Earth, you only have to rotate the laser in a full arc within a few seconds, then it will move faster than the speed of light on the moon! This simplified explanation would be all there is to say were the moon a disk, but the moon isn’t a disk and this makes the situation more interesting. The speed of the spot also increases the more parallel the surface you aim at is relative to the beam’s direction. And so the spot’s speed increases without bound as it reaches the edge of the visible part of the moon. That’s the theory. In practice of course your average laser pointer isn’t strong enough to still be visible on the moon. This faster-than-light motion is not in conflict with special relativity because the continuous movement of the spot is an illusion. What actually moves are the photons in the laser beam, and they move at the always same speed of light. But different photons illuminate different parts of the surface in a pattern synchronized by the photon’s collective origin, which appears like a continuous movement that can happen at arbitrary speed. It isn’t possible in this way to exchange information faster than the speed of light because information can only be sent from the source to the surface, not between the illuminated parts on the surface. That is for what the movement of the spot on the surface is concerned. Trick question: If you sweep a laser pointer across the moon, what will you see? Note the subtle difference – now you have to take into account the travel time of the signal. Let us assume for the sake of simplicity that you and the moon are not moving relative to each other, and you sweep from left to right. Let us also assume that the moon reflects diffusely into all directions, so you will see the spot regardless of where you are. This isn’t quite right but good enough for our purposes. Now, if you were to measure the speed of the spot on the surface of the moon it would appear on the left moving faster than the speed of light initially, then slowing down as it approaches the place on the moon’s surface that is orthogonal to the beam, then speed up again. But that’s not what you would see on Earth. That’s because the very left and very right edges are also farther away and so the light takes longer to reach us. You would instead see a pair of spots appear close by the left edge and then separate, one of them disappearing at the left edge, the other moving across the moon to disappear on the other edge. 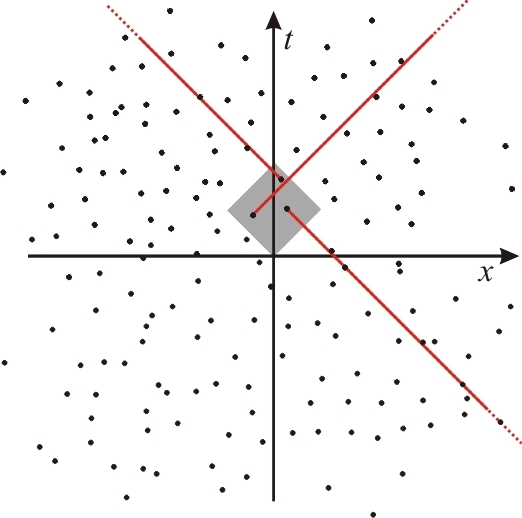 The point where the spot pair seems to appear is the position where the velocity of the spot on the surface drops from above the speed of light to below. This pair creation of spots happens for the same reason you hear a sonic boom when a plane passes by faster than the speed of sound. That’s because the signal (the sound or the light) is slower than what is causing the signal (the plane or the laser hitting the surface of the moon). The spot pair creation is thus signal of a “photonic boom,” a catchy phrase coined by Robert Nemiroff, Professor for astrophysics at Michigan Technological University, and one of the two people behind the Astronomy Picture Of the Day that clogs our facebook feeds every morning. The most surprising thing about this spot pair creation is that nobody ever thought through this until December 2014, when Nemiroff put out a paper in which he laid out the math of the photonic booms. The above considerations for a perfectly spherical surface can be put in more general terms, taking into account also relative motion between the source and the reflecting surface. 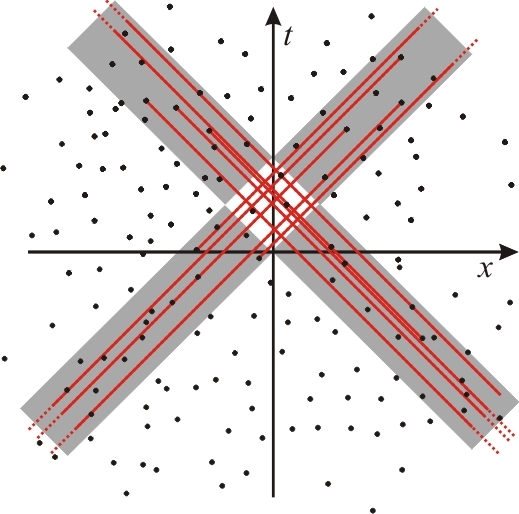 The upshot is that the spot pair creation events carry information about the structure of the surface that they are reflected on. But why, you might wonder, who cares about spots on the Moon? To begin with, if you were to measure the structure of any object, say an asteroid, by aiming at it with laser beams and recording the reflections, then you would have to take into account this effect. Maybe more interestingly, these spot pair creations probably occur in astrophysical situations. Nemiroff in his paper for example mentions the binary pulsar 3U 0900-40, whose x-rays may be scattering off the surface of its companion, a signal that one will misinterpret without knowing about photonic booms. The above considerations don’t only apply to illuminated spots but also to shadows. Shadows can be cast for example by opaque clouds on reflecting nebula, resulting in changes of brightness that may appear to move faster than the speed of light. There are many nebula that show changes in brightness thought to be due to such effects, like for example the Hubble Nebula (HVN: NGC 2260). Again, one cannot properly analyze these situations without taking into account the spot pair creation effect. In his January paper, Nemiroff hints at an upcoming paper “in preparation” with a colleague, so I think we will hear more about the photonic booms in the near future. In 2015, Special Relativity is 110 years old, but it still holds surprises for us. This post first appeared on Starts with A Bang with the title "Photonic Booms".